For over a month, we have been telling the boys that we are going to see The Wiggles soon. That day finally arrived. NHL understood what we were talking about. He is a pro and has seen The Wiggles twice before this. JSL had no idea. 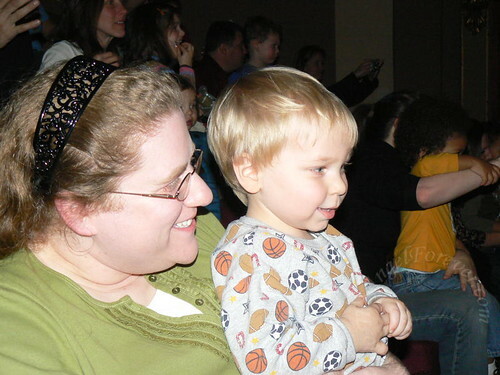 This was his first Wiggles live experience (Six Flags does not count). He probably figured we were taking him to watch a DVD in a new location. When we arrived at the venue, we bought the program for the show. We really did not need shirts, we have tons of DVDs/CDs, and can get the stuffed toys from Wiggles World at Six Flags if we need/want them. The boys were thrilled with this. 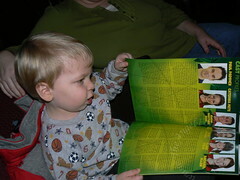 While the little guy looked around the theater, NHL and I browsed through the program. Then JSL saw it and well, it was his from this point on. The theater filled up pretty nicely. Of course before the show, TechyDad and I joked that tons of sick kids would probably be there to spread things like the flu and more. Sure enough, a group sat next to me. As I was feeding JSL a snack I heard her on the cell phone telling someone that her child had been sent home from daycare. Why? Oh, because the child had a fever. The best part – several other kids in the facility had already tested positive for H1N1. GRRR! 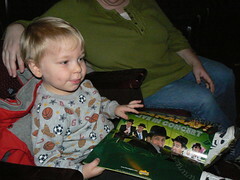 About 20 minutes before the show, they put on a DVD that was advertising The Wiggles and their affiliation with Sprout. The sad part is, anyone in our area that has Time Warner Cable does not receive Sprout – like us. JSL was so thrilled. When it was over he was upset. We tried to explain that this was not the show and The Wiggles were really coming. 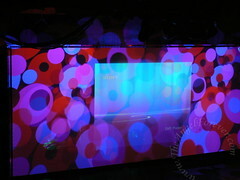 They played this video one more time and then the show started soon after. JSL sat on my lap so he could see over the railing near our seats. His body stopped cold in it’s tracks the second he saw Jeff come onto the stage. Of course, this was nothing. Each time a new Wiggle arrived onto the stage he grabbed my hand and just kept staring and the smile got bigger and bigger! The part that really got him was when the Big Red Car came onto the stage. While JSL took it all in and watched The Wiggles, big brother NHL was up dancing and singing the entire concert. 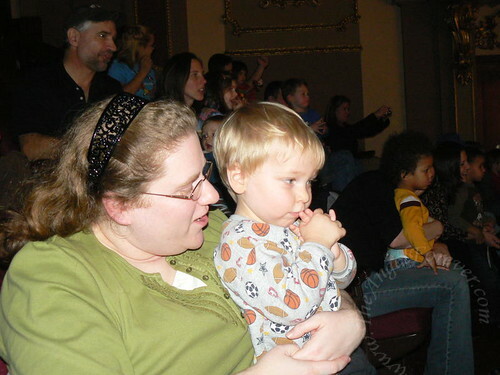 He had a fabulous time watching this very different Wiggles show. At the end of the night, as we were walking to the car, I asked NHL which was his favorite Wiggles show. He said this one since he did not remember the others too much and then complained. 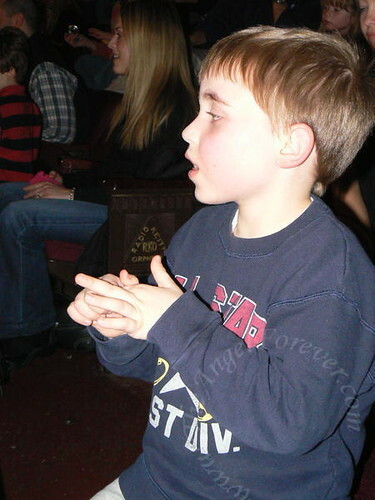 Why was he complaining – the poor kid had no voice from singing along with The Wiggles for an hour and a half! TechyDad and I both loved the show. Not only was it wonderful watching the boys as they enjoyed the show, we thought it was a great production. 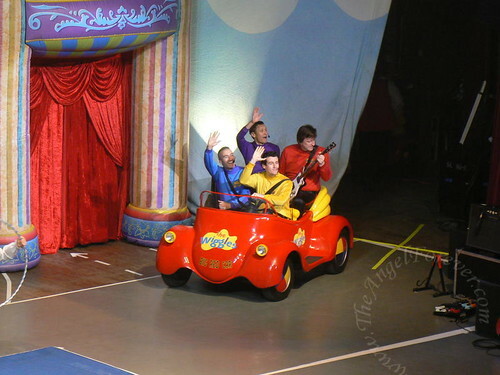 The Wiggles Go Bananas tour was like a Cirque du Soleil and Wiggles production combined. Confused? Not to worry more photos coming soon to explain what I mean. TechyDad took some amazing photos and fun videos that I will share to tell the store. The Wiggles actually encourage their fans to take as many photos and videos as you like – sweet! OMG I am a little jealous I have a total Mom crush on Anthony, he is a handsome guy :) I bet after being sick this was a nice treat for you guys. Have you consider looking into Direct TV? We have it and Sprout- Meg LOVES Kipper and Angelina Ballerina. .-= Susan´s last blog ..Taking Away =-.